Nahem is a contemporary artist born in Notting Hill where he still lives and works. 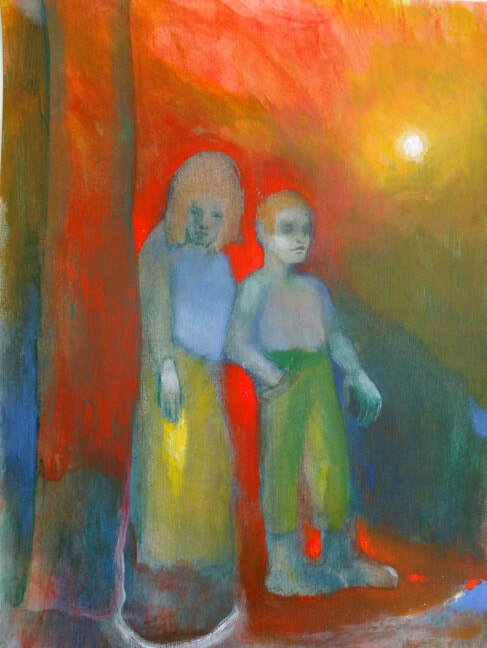 ​Nahem has an international reputation as a painter of contemporary multicultural life. Until 2007 Nahem painted from life giant heads of people from black and ethnic backgrounds. Nahem then turned to other subjects that drew on 'unreal' sources, photograph, TV and film as well as memory, creating hugely multi-layered paintings bursting with incident, including floods and nuclear explosions. Nahem made another dramatic move, "from a tangible kind of reality to something quite intangible where accident has been allowed to prompt imagination." ​Most recently, Nahem has focused on making a deep study of trees in city parks and heaths, seeing them as forests of the city. Nahem sees the forest as a fragile thing, reminded whilst drawing trees that millions of acres of forests around the world are being destroyed. Nahem graduated with a BA Fine Art Painting from Manchester Polytechnic 1991, followed by post graduate study at Slade London 1993 and an MA from the Royal Drawing School 2004. ​Nahem has exhibited widely throughout the UK, and his work is in museums including the Exeter Museum and Art Gallery, Plymouth City Art Gallery and Museum, the Hartlepool City Art Gallery, the Herbert Art Gallery and Museum Coventry, where he exhibited his work alongside, Freud, Auerbach, Bomberg and Lenkiewicz, and in Bury City Art Gallery. Nahem has shown at a number of recent high profile group exhibitions including 2018 Crosses, Crucifixion Now/ Resurrection Now: Art of Death and Life, Southwell Cathederal, 2017 Into The Wild Abyss (3 person show with Gordon Cheung and Rui Matsunaga) Royal Albert Memorial Museum, 2017 Portrait exhibition Face to Face, The Herbert, Coventry City Art Gallery and Museum, 2016 Hard-Boiled Wonderland, (3 person show with Rui Matsunaga and Marcelle Hanselaar) at the Jessica Carlisle Gallery, London. Nahem's work is in international private and public collections.